We offer an outstanding choice of sliding wardrobe doors, fitted bedroom furniture and intelligent storage solutions, with designs ranging from the classic to the contemporary....modern to traditional and at prices to suit all tastes and budgets within the Cardiff area. Our sliding wardrobe door product range is incredibly versatile and extends into the bedroom, home office/study and lounge. In fact almost anywhere that fully or semi fitted furniture is preferred. Choose from our range of sliding wardrobe doors, luxury fitted bedrooms, home office and storage solutions all professionally designed and installed by our experienced installation teams. Take advantage of three decades of experience and talk over your personal requirements with our designer. In the comfort of your own home, our designer will help and work with you to find the answer to your storage problem and create something unique. We also have a showroom where a selection of our bedroom furniture and fitted wardrobes can be viewed and better appreciated. 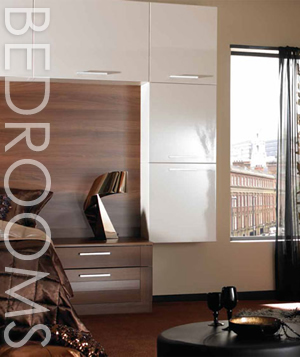 With such a wide range of designs our fitted bedrooms will be at home whatever style or age of your home. Seamless integration into your bedroom means more space, more storage and less clutter. Fitted Bedrooms Cardiff, Bristol, Newport and Sliding Wardrobes and Sliding Wardrobe Doors in Cardiff - Bath - Bristol - Torfaen - Swansea - Pontypool - Cwmbran - Cardiff Bay - Abergavenny - Heads of the Valleys - Ebbw Vale - Brynmawr - Abertillery - Caldicot - Usk - Magor - Raglan - Newport - Cardiff - Monmouthshire - Gwent - Monmouth - Merthyr Tydfil - Tredegar - Penarth - Swansea - Port Talbot - Neath - Aberdare - Bridgend - Caerphilly - Risca - Pontypridd & Chepstow. We provide fitted bedrooms and wardrobes in Bristol including the South West. Call us now for a quote!